The architect duo had a recess detonated into the side of the mountain, then elegantly incorporated a double-storey dwelling into the topography of the land – all the while making the most of the splendid and far-reaching views. 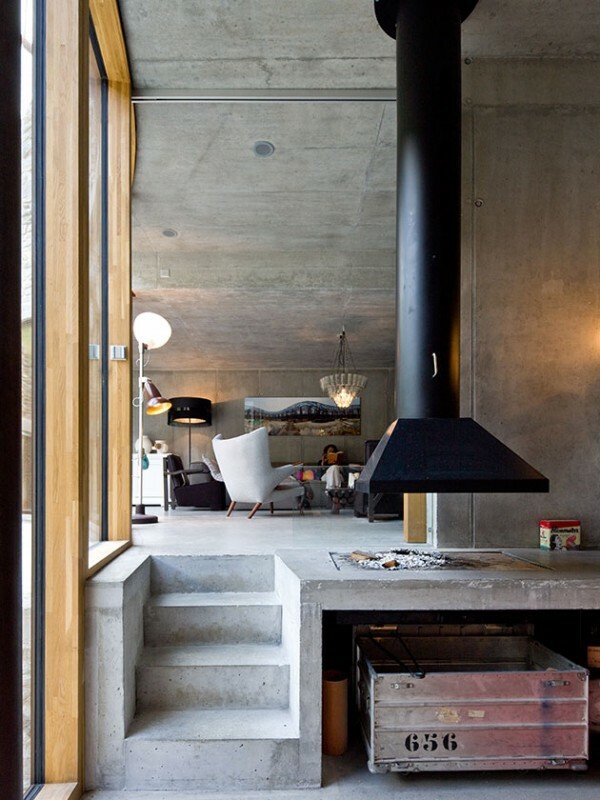 For structural reasons, the building is enclosed completely on the inside by an exposed concrete shell. This ensures that this new addition to the landscape is safeguarded like a cocoon from any movement of the mountain. The space between the concrete shell and the mountain has been filled with foam concrete for added heat insulation. The sweeping concave front façade of the villa is clad with quarry stones from the local region, in a bid to blend in yet more convincingly with the natural surroundings. Windows of varying sizes are juxtaposed across the south-facing frontage – and at varying heights too, reflecting the ‘half-storeys’ inside the house. Directly in front of the house is an elliptical courtyard terrace, which is sheltered by rising walls on each side. These walls are in fact also the side walls of the villa itself, whilst the overall design has a circular form from a bird’s eye perspective. 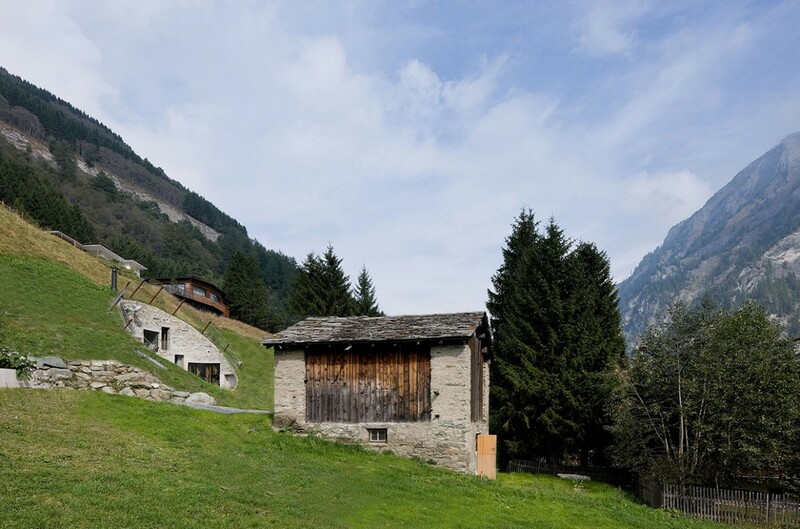 But back to the traditional Alpine barn, which stands a little distance away from the villa itself. It is absolutely typical for this region. The upper floor, accessible from the mountainside, is a haystack, while the lower floor, accessible from the valley side, usually serves as a shelter for livestock. 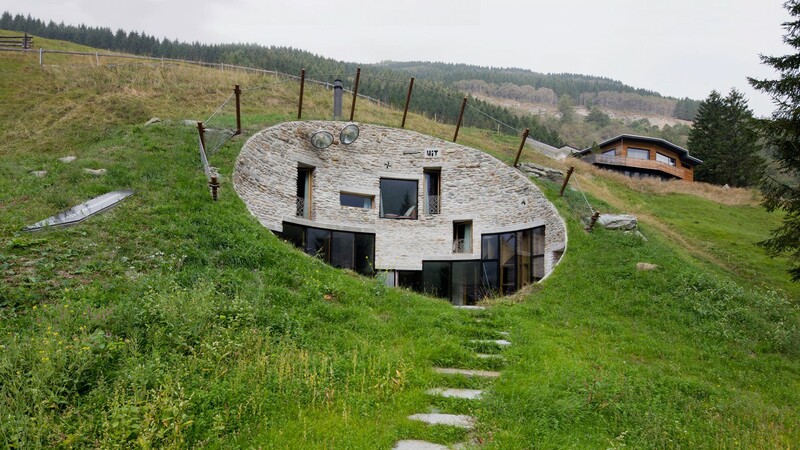 The architects of Villa Vals have converted their barn into a kind of reception building. You can park a car at the top and store away your ski equipment in the lower part of the structure. 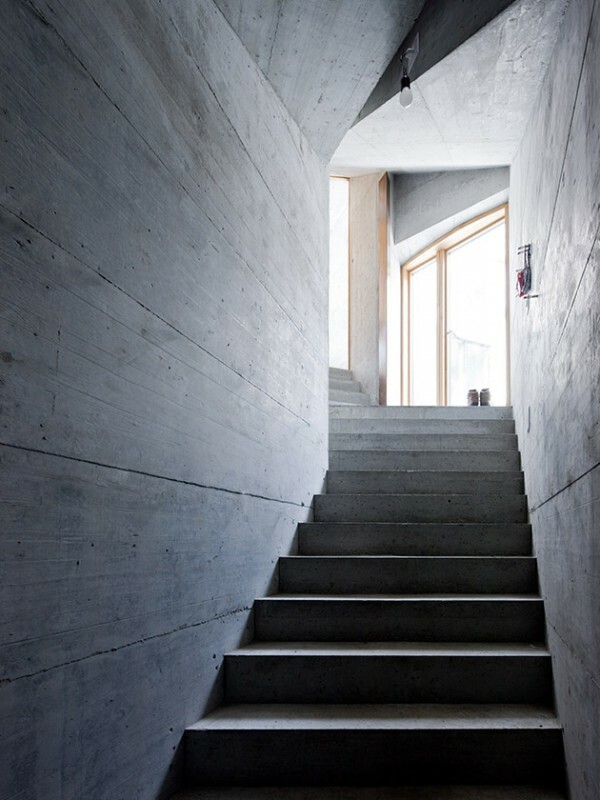 From here, a 22-metre underground passage leads residents and visitors to the house. “We’ve added an element of drama here too,” said Bjarne Mastenbroek. “Instead of being a straight tunnel it is slightly offset like a bayonet, so there are a few turns to take. Two skylights let natural light flood in. Once you reach the end of the tunnel, an approx. six-metre flight of stairs leads to two doors: one into the house and the other straight out to the courtyard.” The real ‘wow moment’ though comes once inside the surprisingly bright interiors of this in-land dwelling. The living room and kitchen alone share some 50 square metres of window openings facing south. The views play the starring role throughout this home. 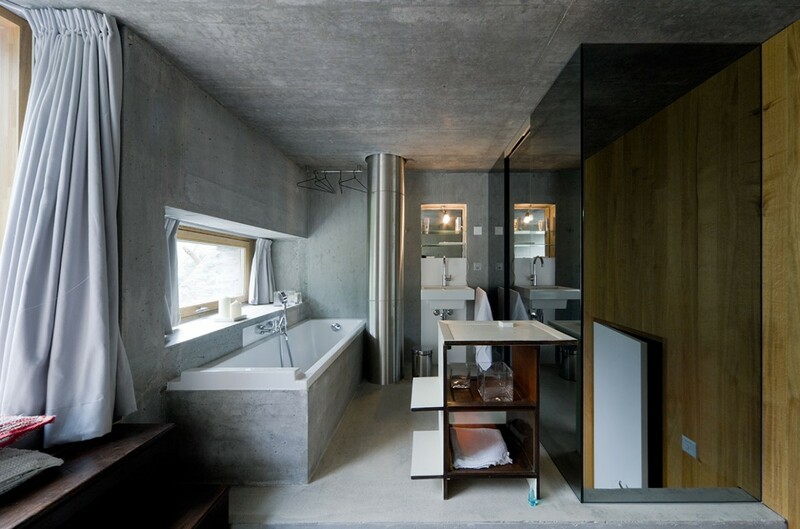 In fact, each of the four en suite bedrooms look out to the terrace and the mountain scenery beyond. Despite its bunker-like position, this building exudes a distinct sense of light and expansiveness throughout thanks to its large window openings on the various half-storeys. “This place is at its most wonderful when there’s at least half a metre of snow,” the architect enthuses. 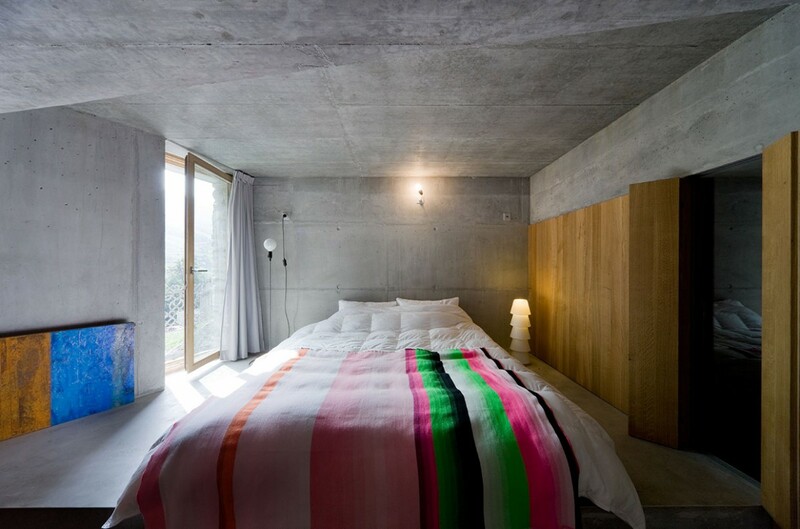 “Everything is transformed into this almost surreal white wonderland, and the villa takes on an unbelievably cosy feel.” In-situ concrete is the dominant aesthetic force here. The grain and cast marks of the cladding still remain visible on its surface. The other structural elements in natural-coloured woods form a warm contrast. They include the window frames, wall cladding and doors. One of the greatest challenges, according to Mastenbroek, was the lighting. Only by spending time living in a house is it possible to find out for sure whether the original lighting concept actually works. He had to rethink some elements here, and rehang or reposition several lights, but now he is satisfied with the result. Luminaires also feature here by perhaps the most famous Dutch designer of them all: Hella Jongerius. 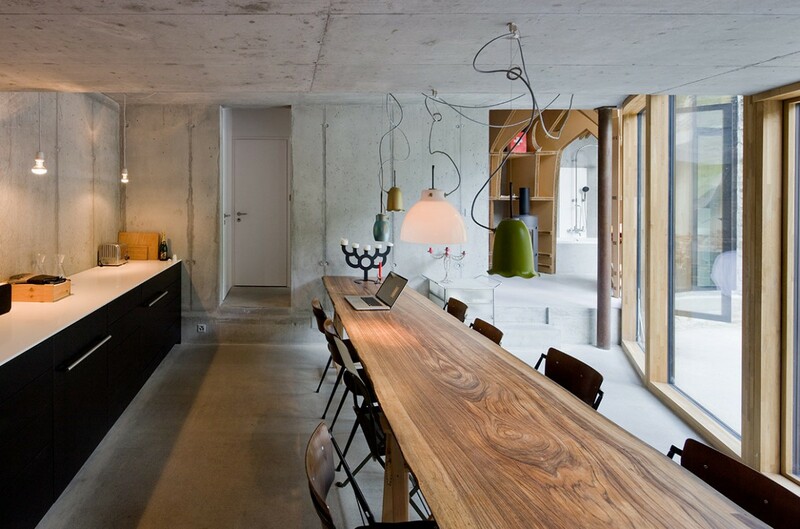 Different variants of the ‘Blossom’ lamp, which she designed for the Swiss label Belux, hang above the wooden kitchen table, which is several metres long. 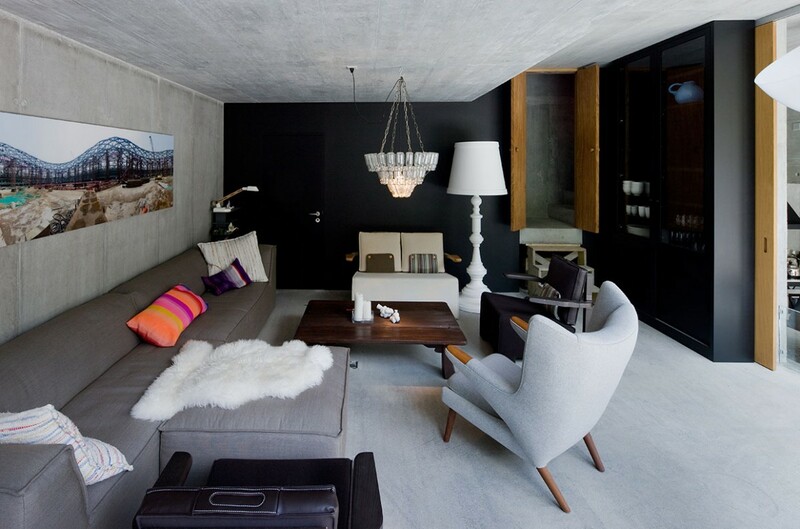 Dutch design is a very strong influence throughout the interior, in fact. Original objects by the likes of Marcel Wanders, Demakersvan and Scholten & Baijings bring a playful, softer touch to the otherwise meticulous character of the house. They are found both in the open plan space on the ground floor with its living room and kitchen, and in the upper rooms, which are reached via a staircase from the living area. Modern design from the Netherlands can even be found outside in the courtyard, in the form of the ‘Dutchtub’ by Floris Schoonderbeek. Sky-blue in colour, this oversized polyester tub has a heating coil and fire basket for heating the water to bath temperature in the winter. Absolutely perfect for jumping in on a chilly day and soaking up the magical atmosphere of Vals.